Chard is the bouquet of the Garden! Plant it for pretty! Plant it as a centerpiece, at the front, by the entrance. Contrast it with frillys like carrots or in the spring with dill. Chard is fabulous in containers on the balcony, mingled with ornamentals in your landscape, and brightens any veggie garden, especially in Mediterranean WINTER gardens! Whether it is all green, a white stemmed Fordhook Giant, or Bright Lights/Neon from white to neon pink, bright oranges and reds, brilliant yellow, it is glorious! And it’s not just another pretty face, it’s a prodigious producer, Cut-&-Come-Again, and again, and again! In our SoCal clime, it acts as a perennial, sometimes living for several venerable years! Low calorie, only 35 calories per cup, it is packed with vitamins K, A, C, E, and B6, a valuable food for maintaining strong bones. Chard is also very good source of copper, calcium, phosphorus, and a good source of thiamin, zinc, niacin, folate and selenium! According to Aug 2013 HuffPost Kale has a LOT more Vitamin A, twice as much Vitamin C, but Chard has almost 4 times the iron! they are about equal in calories, fiber, protein and Calcium. A different Oct 2017 post says: [Kale] has more than twice the number of calories of collard greens or Swiss chard. Salt is another story. Kale has only 30 micrograms of sodium, whereas Chard has 313! All these counts may make no difference to you, because kale leaves may taste bitter to you, and are tough to chew unless massaged for salads or steamed. Chard is less vegetal in flavor than kale, even the stems can be slightly sweet! And Chard comes in all those dazzling bright colors! Chard is a lot like Spinach, but has an earthier flavor. Dr Weil says: …concentrations of oxalic acid are pretty low in most plants and plant-based foods, but there’s enough in spinach, chard and beet greens to interfere with the absorption of the calcium these plants also contain. TreeHugger says further: Raw versus cooked spinach offers a trade-off. Vegetarian Times writes that folate, vitamin C, niacin, riboflavin, and potassium are more available when spinach is eaten raw, cooking increases the vitamins A and E, protein, fiber, zinc, thiamin, calcium, and iron – as well, important carotenoids, such as beta-carotene, lutein, and zeaxanthin, also become more absorbable when spinach is cooked. The advice is eat lots of different veggies both raw and cooked! In a sense, Chard, Beta vulgaris, is a relatively new vegetable that is thought to have first been described in the mid-18th century. It is also known as Swiss chard, silverbeet, spinach beet, and even spinach in different parts of the world. It is in the same family as beets, but doesn’t make a bulb like they do. Chard is one of the top 5 veggie producers per square foot! It is a fast prolific crop maturing in only 55 days! It tolerates poor soil, inattention, and withstands frost and mild freezes. Besides being a beauty, having a blazing array of colors, leaf after leaf it feeds a family! Though the colorful hybrids are stunning, and your shopping list is delighted with their magical names, the older green forms tend to out produce them and are more tolerant of both cold and heat. The mammoth white stemmed heirloom Fordhook Giant can’t be beat! It grows up to and more than 2′ tall with huge leaves, and feeds an army, with heavy yields even in hot weather! Chard may be considered an all season plant in SoCal, but it suffers in heat. It wilts terribly mid day. The problem is heat, not water, and sometimes gardeners literally drown them with water, rotting the root. Either put up some shade cloth, or don’t grow them in summer. After x number of wilts, they never quite recover their full zest and radiance. 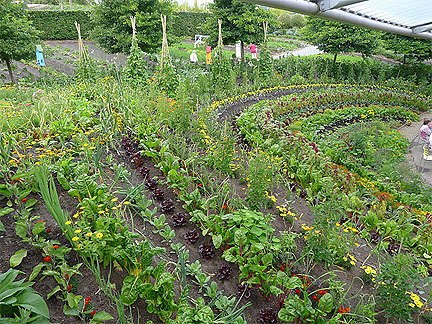 At the community gardens, there are none left by mid summer. Soon you can be growing it again ~ they thrive and grow quickly in cooler fall weather! Varieties Cornell lists 49 chard entries! Five Star ratings go to Burpee’s Rhubarb Chard, Verte a Carde Blanche and Verde da Taglio. Bright Lights is an All America Selection winner! Umania is a Japanese chard that tolerates heat and cold, is slow bolting. Flat leaved or bumpy?! Bumpy, called Savoyed, leaves give more chard per square inch, but they can also hide aphids. Narrow or wide ribs. Green, crimson or purple leaves! Rib colors galore, from white to neon to the darkest reds! You can see why chard is frequently used in flower gardens! Do you like that purple one with the yellow rib?! The beauty on the left is Prima Rossa! The cooler the weather the deeper the color! 28 Days for tender little leaves, only 55 days or so to maturity. Chard likes a rich sandy loam soil – well manured and composted with worm castings added. It is sensitive to soil acidity. A low soil pH results in stunted growth. Consistent water, full sun, and plenty of space! A healthy chard, will take a 2′ to 3′ footprint, more if it is a Fordhook Giant! At 28” tall, it makes a shadow, so plant accordingly! Soak seeds overnight or presprout! Direct seed into the garden 3-5 weeks before the last frost date, or you can start seedlings indoors around the same time. Transplant seedlings after your last frost. Chard seeds germinate best in soil temps around 75°F-85°F (not air temps) but 50°-55°degrees will do, and is practical. Avoid seeding during daytime air temps of 80°F or more. In SoCal, one of the best times to plant is mid August for production all winter long. Plant then in the shade, on the north or east sides, of taller plants that will be replaced by fall plants or will finish soon. Chard seeds don’t mind those hot August soil temps, but Chard plants here do best in cool weather, wilting pitifully midday in hot summer temps. Check your soil to see your plant really needs water or is reacting to the heat. Germination will take 5-16 days. Chard seeds are actually a cluster of seeds and will produce more than one plant. 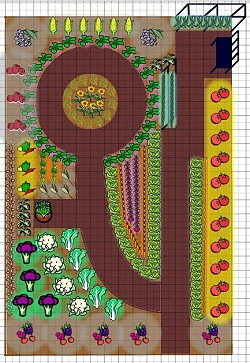 Spacing will determine the size of the plants. Space plants at 4″-6′ apart within rows spaced at 18″-24″ apart. When the young plants are 4 inches high, thin them to stand 8 inches apart. If you are pest and disease conscious, keep right on thinning so adult leaves don’t touch each other! That, of course, depends on the size of the variety you pick. 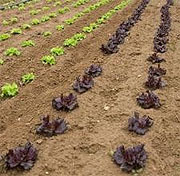 Depending on your space and needs/wants, avoid planting in rows, plant far enough apart that mature leaves don’t touch leaves of another chard plant. Interplant here and there. That way Leafminers, aphids and diseases can’t go plant to plant. if you have space, you can broadcast your seeds in sections of the garden to create a bed of tender leaves and thinned to 4 inches apart as they mature. Otherwise, plant your seeds 1/4-3/4 in. deep. That will give you a steady table supply of tasty little greens! Mulch in summer keeps roots cool and moist. In So Cal winters it keeps rain or watering from splashing soil up onto the leaves. Water! Chard, like Lettuce, likes plenty of water regularly to keep it sweet. It’s putting up big leaves again and again. Weed early and often! Feeding! Since Chard is a prolific producer, it needs feeding from time to time. In summer it can use a little compost and a tad of manure. Some worm castings would make it even happier! Late summer spread a little compost over the root zone, drench with a water-soluble organic fertilizer. They will make a strong comeback early fall. In winter a light feed of fish emulsion is easy to apply, and easy for it to uptake. Hose APHIDS off Chard, kale and brocs. Keep doing it for a few days to catch the ones you missed, and new generations. 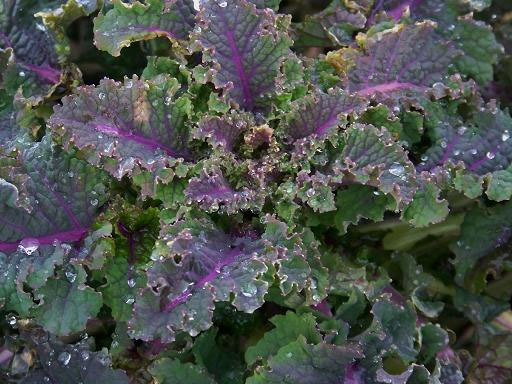 For hard to get at places, down the centers of chard and in crinkly kale leaf crevices, get out that spray bottle! Treat once, wait a couple days, treat the ones that got away and newborns. I tried this home remedy, it WORKS! The simplest is to spray with 2 parts alcohol, 2 parts water, 1 part soap. DO NOT use on seedlings, it will kill some of them. Spritz lightly rather than drenching or you may kill your bigger plant too! If the aphids are totally out of control and you can’t get to them down in the center of the plant, if you are very brave, cut the whole plant off a couple inches above the crown, let it produce new leaves. Leafminers are the bane of chard, spinach and beets, going from plant to plant. These are not plants to row crop! You know you have leafminers when you see their trails or brown patches on the leaves as the miners burrow between the leaf’s layers. Remove those sections and badly infested leaves immediately. Keep your chard harvested. Harvest while the leaves are fresh and a bit smaller before the leafminers get to it! Some say soft fast growth is perfect habitat for the miners, but chard is meant to be a fast grower with plenty of water to keep it sweet! So if you can’t eat it all, find a friend or two who would appreciate some and share your bounty! Or remove plants until you have what you can keep up with. Plant something else delicious in your new free space! Slugs & snails are chard’s other not best friends. Irregular holes in the leaves, that’s the clue. Remove by hand, checking the undersides of leaves and down in the center area where new leaves are coming. I chuck snails and slugs where our crows gourmet on them. Or use Sluggo or the cheaper store brand in the cardboard box of the same stuff. Lay down Sluggo two or three times to kill the generations then you won’t need to do it again for quite awhile. Cut or twist off stems of outer leaves while still tender, 1-2 inches above the soil surface. Leaves are of best quality just when fully expanded or slightly smaller. Chard loses water very quickly after harvest, so give it a rinse, shake off excess water, pack loosely in a plastic bag, get it into the fridge. Use ASAP, 3-4 days! Do not store with fruits, like apples, and vegetables that produce ethylene gas. Blanch and freeze leaves if you like; use in soups and stews later. Like other biennial plants, chard produces flowers and seeds in the spring of its second year, after it has been through winter. Let your favorite chard make a flowering stalk, seed and dry. Label it before it starts drying so you know what color or variety it is. The seed is super easy to harvest. Just hold your fingers close to the stalk, zip them along the stalk and put the seed in an airtight container. Label it right then and there because you can’t tell chard seed from beet seed! Same family. If you want that variety of colors, and don’t have room or the time to let all of them seed out, just get a packet at your local nursery or online from your favorite seed house. Keep your seeds cool and dry, viability 3+ years. Harvest plenty for you, gifts for friends, seed swaps! When preparing your chard, if you are eating it for the Vitamin A, trim the leaf from the rib. You can eat the rib, it just takes a little longer to cook unless you chop it up into little pieces. Ribs have healing factors all their own due to their colors! Here’s a surprise – use stems like celery! Stuff and serve! Or pickle them, or the crisp ribs can be steamed or grilled like asparagus! Small leaves in salad, drizzle with a sauce or dressing of your choice. Larger leaves chopped, steamed over rice or in stews. Toss with olive oil and stir fry with your favorite veggies and protein. Layer in lasagna or a casserole of scalloped potatoes or turnips. Everyone has their favorites! Deb Elliott of Helena AL loves hers in chard soup, beginning with chicken bouillon, Italian sausage, onions and little red potatoes. Chopped chard leaves are added toward the end, as it only takes a few minutes for them to cook. Chard can be used as a substitute for spinach in most dishes and goes well with roasted meats, cream sauces, nutty cheeses, and tomatoes. Try adding chard to au gratin or serving it alongside Jamaican Jerk chicken with red beans and rice. Squeeze out excess water, and use the cooked chard in casseroles, quiches, or as a succulent side dish. Or try this Vegetarian Stuffed Chard Oregon Style from Organic Authority! Cabbage is substituted by chard in this Pacific Northwestern version of a Scandinavian recipe. Light, nutritious and deliciously healthy, the chard leaves are stuffed with a grain of choice alongside Oregonian staples like hazelnuts, dried cranberries, goat cheese and late summer veggies for a satisfying and wholesome dish. The red, pink, white and yellow veins of rainbow chard leaves are an excellent choice for this chard recipe, especially if you are looking for visual appeal. Serve it as a main vegetarian dish with a side of yogurt sauce, homemade chutney or lemons wedges, or make smaller ones to serve as pop-in-your-mouth appetizers. CARROTS! Steaming, Roasted, Juicing, Snacking, Salad! Colorful carrots brighten your table any time of year! Their pretty ferny foliage is lovely in your garden. It is so much fun pulling gorgeous fat, long, colorful carrots! Downright satisfying. What a beautiful fragrance…. Tops can be eaten too, or are prime in your compost. Varieties Galore! Thumbelinas – fun for the kids to grow, stubbies, conical, to long, long pointy skinnys. If you are hungry sooner, choose early maturing shorter varieties. Plant different kinds for the fun of it! With mixed seed packs you never know which color you will pull up! Danvers is an excellent choice for cooking. It has a higher fiber content than Nantes sorts. It grows well in heavier soils and stores well in the soil at maturity. Super juicing carrots are Healthmaster or Danvers. Autumn King and Scarlet Nantes are excellent cold tolerant varieties. If you would like some tender little snacking carrots, quick growers to show the kids, or minis for your pup, try early Adelaides from Johnny’s Selected Seeds! They say ‘True baby carrots. Unlike most “baby carrots,” which are harvested at an immature stage before properly filling out, Adelaide is a true baby, meaning it has an early maturity and forms a blunt root tip at 3–4″ long.’ Only 50 days! At left is the French heirloom Parisian, an early orange-red carrot that grows almost more like the shape of a large radish. It excels in clay or rocky soil where other carrots have problems developing properly. Carrots are scrumptious companions! Planted a little too closely and not thinned, they twist together in the garden, but better yet, is they enhance peas while they are growing! They grow way slower than peas, lasting while pole peas are getting their full height. They are quite faster than cabbage, so perfect to grow among cabbages until the cabbages would finally shade them out! Onions, leeks and chives help repel the carrot root fly. Carrots thrive when Cilantro, Chamomile, Marigold are planted with them. Skinny carrots for roasting are a treat! The Tiny Farm blog says: Sprint, a new Amsterdam forcing variety (good for growing in challenging conditions) matures long and slender in a listed 42 days. That’s fast, over two weeks ahead of the quickest regular carrot we grow (the fabulous Nelson). SOIL Stone/rock free loose soil is best for those long rooted champions! But they are smart enough to wind their way around a stone or two if you ask them to grow there. They like steadily moist soil. If the soil gets dry and you give them a big soak, they are likely to split, and that’s not pretty. NO manure! It makes them hairy and they fork. Their favorite season in SoCal is winter when the soil is usually more continuously moist. Best germination soil temps are 50 F to 75 F, but they will germinate at as low as 40 F.
PreSoaking is easy. Pop the number of seeds you want to grow, with few extra for whatever might happen to them, in a cup of warm water, soak over night. On a raised edge plate, lay them on one side of half a folded paper towel. Lay the other half over and pat dry. Easy peasy! Weather tip: Don’t soak your seeds the night before a rain is expected. Wait for good planting conditions. Rain compacts the soil, making it harder for tiny sprouts to break through, and seeds might be washed away or tiny sprouts broken if sprouting seeds are shifted in wet soil. PreSprouting is devilishly clever! Sprouted seed will grow in soils too cool for germination! You take only the sprouted seed to plant into the garden – that’s a form of 100% germination! Grab a raised edge plate, lay a paper towel on it. Spread your seeds out a 1/2 to an inch apart, so ther is room for their sprouts. Spritz them with good water. Lay another paper towel over them and dampen it too. Put the plate in a plastic bag, tie it, keep moist until they germinate! Just before planting time, put them on a dry paper towel and let them drain if needed. Grab some tweezers and plant very carefully immediately. The sprout is the root, so it goes down. Not to worry if they just plop in the planting hole any which way. They know what to do and will find their way, but the seed itself needs to be at the right planting depth so the little leaves can get up. Since many carrot seeds are tiny, this reduces waste of your seeds, and no time is lost later thinning these tiny plants! If you don’t presprout ~ Carrot seeds are very small, and it is difficult to obtain a stand if the soil is crusty. Try mixing carrot seed with dry sand to get even distribution. Then, instead of covering with soil, cover the seed 1/8-inch deep with sawdust, vermiculite or manufactured potting soil. Water the row soon after planting is complete. This method will allow the seeds to stay wet and prevent crusting. Plant at the spacing they need at their maturity. For broad carrot shoulders like Chantenay, plant as much as 3″ apart. For baby carrots, plant closely, a half inch or slightly less apart. If you overplant, thin the carrots when they are 1 to 2 inches tall. Best to cut off with tiny scissors rather than pull and disturb or damage the remaining plants’ roots. Keeping the seeds moist is a commitment that must be kept. Do put down Sluggo or the like, before the seedlings come up because seedlings can be mowed overnight. Weeding is an important delicate operation. Carefully clip little weeds away rather than pulling and disturbing or breaking tiny carrot roots. Shoulders, hilling. Carrots naturally push up and grow above the soil line. Planting seeds deeper doesn’t compensate. Instead, have extra soil handy to hill over those shoulders. Uncovered shoulders turn green and need to be cut away. Harvest when their orange color is bright, when their flavor and texture are optimum. Water well prior to harvest to ensure the roots have absorbed their maximum capacity of water and are easy to pull. Don’t harvest carrots too soon, sugars are formed relatively late. STORAGE Remove the foliage right away. It takes moisture from the carrot, causing it to wilt. Put them in the coolest part of the refrigerator in a plastic bag or wrapped in a paper towel, which will reduce the amount of condensation that is able to form. Research shows the especially valuable (all-E)-beta-carotene isomer is well-retained in carrots stored properly. Store away from apples, pears, potatoes and other fruits and vegetables that produce ethylene gas since it will cause them to become bitter. Culinary Carrots! Eat them rinsed and raw right at the garden. Many a carrot never makes it to the kitchen! Pare into thick strips, flowerettes. Diagonally chop, ripple slice, dice. Make lengthy Julienne quarters. Freshly shred into green salads, add as garnish on top! Make traditional carrot & raisin salad. Carrots, celery and greens juices, smoothies. Steamed & stewed. Roasted, grilled on the summer barbie. Add as nutritious and delicious Carrot Winter Cake, muffins, cookies, pancakes and waffles, cheesecake! Spicylicious Carrot jam. Carrot ice cream ~ See these images, with recipe links, that will positively make you drool! Nutrition?! Oh, yes! Peel your carrots? Old grocery store carrots may have bitter skins, but not likely straight from the ground from your organic garden! Clean is better and keep the skin! Or pare and give the skins to your compost! But here is where ORGANIC counts! Organic produce isn’t sprayed with pesticides that collect in the skin, the plant’s natural filter against foreign bodies – probably why non organic carrot skins are bitter…. “Organic Authority” magazine reports that carrots contain a high degree of phytonutrients, many of which are found in the skin or immediately beneath it. Consuming phytonutrients leads to a number of health benefits, including lessening your risk of cancer and boosting your immune response. The benefit carrots have always been known for is their high beta carotene content, which improves eye and skin health and also boosts your immune system. If you must ‘peel,’ here is a tip from kc girl online: I use one of those white scouring cloths used for non-stick pans (instead of the brush). Hold it in your palm, wrap it around the carrot, and run it up and down with a little twisting action while under running water. It kind of “sands” the carrot and takes off just a little of the skin. Purple Carrots! The ORIGINAL wild carrot was white or purple! The domestic carrot we eat today has been bred for size, a less woody core and sweetness! Purple carrots have even more beta carotene (good vision) than their orange cousins! Like blueberries, they get their purple pigment from anthocyanins, powerful antioxidants that protect key cell components. They grab and hold harmful free radicals in the body, help prevent heart disease by slowing blood clotting, and are anti-inflammatory (arthritis). So, they are cheaper than blueberries, higher in beta carotene, and you can grow them just about anywhere! Safety note! If you have diabetes or are at risk for developing the condition, read this info from the UK World Carrot Museum! Green buds, white flowers, brown seeds! Carrots, Daucus carota subsp. sativus, are in the Umbelliferae family, make these magical flower heads, then seeds! Every season let one or two grow up and make beauty in your garden – flower food for the pollinators/beneficial insects, then seeds for you and the birds! Carrots are one of the ten most economically important vegetables crops in the world, China, Russia and the US producing the most. California produces over 85 percent of all car­rots grown in the United States, Kern County the most. That has probably changed with the drought…. However, the week long Holtville CA Annual Carrot Festival was good to go in 2016, and it’s happening soon again, February 1 – 10, 2019! Carrots have true Fans! There are carrot events worldwide! Mazel tov! To your very excellent health!